The coffee giant says customers with Apple devices in several Seattle neighborhoods could have their coffees delivered by a third-party provider, Postmates. An early test of Starbucks’ new delivery service showed how mobile technology and an army of freelancers have the potential to redefine the ‘run’ part of the coffee run. But be ready for a few glitches. The coffee giant launched a limited pilot delivery service Wednesday in several neighborhoods in Central Seattle, enabling Apple-device users to order on a Starbucks app. The company has partnered with Postmates, an Uber-like delivery service that relies on freelancers. The effort here differs somewhat from the model that’s being tested in New York, in which Starbucks employs its own green-aproned staff to make deliveries within the Empire State Building. The service — which costs $5.99 per delivery — is first being deployed in downtown, South Lake Union, Capitol Hill, Madison Park and Sodo. Starbucks says that there’ll be a one-hour window for deliveries, though most should arrive within 30 minutes. 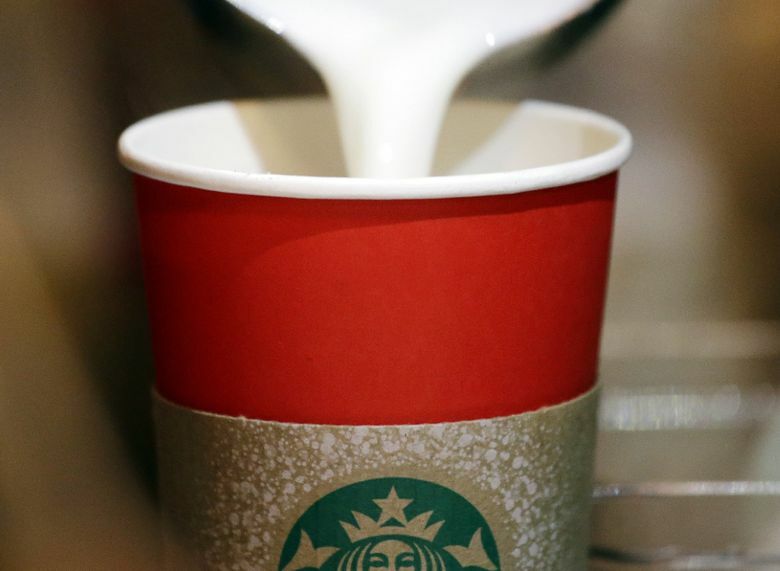 Starbucks says it has no timeline for delivery on the Eastside or other Seattle neighborhoods. The Seattle pilot, announced in March, marks another step in the coffee giant’s bid to build a digital domain populated by loyal customers seduced by convenience and by rewards. Customers already can skip the line by using mobile order and pay — and now, at least in Seattle, they can have their coffee delivered. To give the new offering a spin, The Seattle Times staff ordered two double short lattes and a chocolate croissant from an iPad. Total, including the hefty $5.99 Postmates fee for delivery: $17.80. There’s no minimum order, but there’s a maximum of 8 items per trip. The order was placed at 10:05 a.m. by tapping a button that said “delivery’” on the Starbucks app. It was quickly picked up by the closest store, right across Denny Way. The app lets the customer enter a name for receiving the delivery, the name of the business and any special instructions. It correctly guessed The Seattle Times’ address (1000 Denny Way) but since the building’s entrance is actually on Boren, we made sure to let Starbucks know in the special-instructions box. Soon the picture of a cheerful-looking Postmates delivery courier popped up, along with a button to contact her. At 10:11 a.m. — six minutes after placing the order — a new message appeared: “Delivery in 6 minutes.” A little bike icon appeared on the map to track the delivery. In fact it took 11 minutes from ordering until the Postmates courier showed up at the front desk with an insulated box, courteously delivering a chocolate croissant and one double short latte. Somehow Starbucks didn’t transmit the full order, either to Postmates or to its own store. Between the order placed on the Starbucks app and the one that showed up on the Postmates courier’s smartphone, one latte was missing. So the courier went back and by 10:31 the delivery was complete — a total of 26 minutes, glitch included. Had the two coffees arrived together it would have been as quick, or quicker, than crossing the street and standing in line. Starbucks’ digital foray is seen by analysts as key to maintaining the company’s galloping pace of growth. About one-fifth of transactions in U.S. stores are made on a mobile device, but there could be far more.